Obama’s grade on safety – failing? 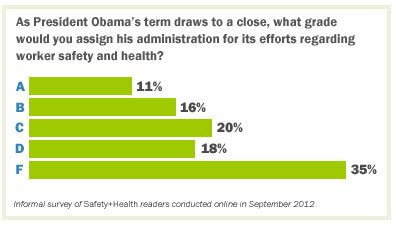 Home » Blogs » On Safety » Obama’s grade on safety – failing? The "On Safety" blog has been discontinued. In a recent survey of Safety+Health readers, more people gave the Obama administration a failing grade on workplace safety than any other passing grade. I was pretty shocked to see the results. I by no means expected respondents to wholly praise the president’s efforts, but I didn’t expect to see such a negative response, either. Some respondents who gave Obama a failing grade seemed to have done so for political reasons or issues unrelated to safety efforts. “If they are not working and staying home are they safer? I give an ‘F’ because they are not even working,” one respondent said, in an apparent reference to unemployment. But many other readers who gave Obama a failing grade were disappointed in the stronger enforcement posture OSHA has taken under the president: “The ‘new sheriff in town’ bravado and sky-high fines have once again created a culture of fear instead of collaboration between industry and OSHA,” said one respondent. In my soon-to-be-published November “Washington Update” column in Safety+Health magazine, I detail some of the initiatives the Obama administration has taken regarding workplace safety during the past four years, as well as areas where it has faltered. Based on these steps and missteps, I’d give the administration a “C.” It has accomplished many things I believe have a positive impact on workplace safety, but it could be doing a lot more. The opinions expressed in "Washington Wire" do not necessarily reflect those of the National Safety Council or affiliated local Chapters.